St. Lucia is sufficiently close to the equator that it does not have well-defined seasons. This means that the weather is warm and balmy all year round which makes it an excellent year round vacation destination. Afternoon rains are more common between June and November and these are usually a refreshing interlude. It would be very unusual to have constant rain showers for an entire day or several days at a time. The Atlantic hurricane season is often mislabeled as the Caribbean hurricane season. Storms can affect the whole region including the US East Coast, gulf states, Caribbean as well as Mexico and Central America." This "so called" hurricane season lasts from June through November. Even if it is called a season, the frequency of hurricanes varies greatly from year to year. We always like to remind travelers that the Caribbean stretches over a region of more than 1 million square miles. Therefore, what happens in one part of the Caribbean will often not have an effect on other parts of the region. Not every hurricane therefore may directly affect your travel plans. Saint Lucia is located in the southeastern region of the Caribbean basin. The active core of the hurricane belt (that part of the open ocean where the storm systems typically gain strength over warm, open water) is located far north of the St Lucia's location. Hurricanes usually gain strength as they move west toward the U.S. and toward the islands in the north of the basin. Most weather systems with hurricane potential that affect Saint Lucia are therefore often immature and weak, not much more than a rain storm. Historically, only 14 hurricanes have moved within 60 miles of Saint Lucia since 1850. Of those, only one has been Category 4 and one has been Category 3. In the past 37 years, only one hurricane affected Saint Lucia directly, in 2010. In 2017, hurricane Maria as a category 2 storm, passed north of Saint Lucia with minimal impact. The risk of a hurricane hitting St. Lucia is the same as the risk in New York. If a weather system develops somewhere but the forecast does not indicate said system will pass over within 75 miles of our island, our regular cancellation policies apply. If a weather system has been classified a tropical storm but not a hurricane and is forecasted to pass over or within 75 miles of our island we will allow a reservation to be cancelled and we will be holding the deposit for a future reservation. The future reservation is subject to blackout dates and the possibility of higher rates. If a weather system has been classified as a hurricane and is forecasted to pass over or within 75 miles of our island, we will allow the reservation to be cancelled and a full refund of the deposit will be given. If a weather system is active, any hotel guest wanting to leave, having to leave, or unable to fly to the island will naturally go penalty free. Please use our online booking engine to check current availability and make an immediate reservation. Our US reservation office is available at Tel 1-800- 223-1108 (Mon - Fri 9:00 am - 7:00 pm Eastern Time and Sat 10:00 am - 3:00 pm Eastern time). From the UK, call 0800-141-2859 (toll free) or 01-189-089-995 (direct). You can contact Jade Mountain directly via 1-758-459-7000. All Reservations originating in Europe can be made through your favorite travel agent or directly with the Resort. 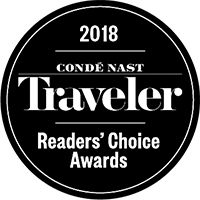 JADE MOUNTAIN works with reputable tour companies throughout Europe. In Germany we can be booked through Airtours, Art of Travel, Atambo Tours, Atelier Voyage, Dertour, Design Reisen, DSI Reisen, Honeymoon Travel, Landmark Fine Travel, Meiers Weltreisen, Thomas Cook. In Austria, we can be booked through Dertour, Meiers Weltreisen, Jumbo Touristik. In Switzerland, we can be booked through Hotelplan, Kuoni Switzerland, Latino Travel - Knecht Reisen. In France, we can be booked through Des Hôtels et des Iles, Tourinter, Sensations du Monde, Directours, Tropicalement Votre, Kuoni, Voyageurs du Monde, Mojito Spirit, Hotelissima, Interiles Voyages, Luxe by Travel, My Travel Chic, Exclusive Island Hotels & Resorts, Privilèges Voyages, Un Monde, Tapis Rouge, Succès Voyage, Tempting Places, Voyages Masson Univairmer, My Luxury Travel. In the UK, bookings can be made through Virgin Holidays, Kuoni, British Airways Holidays, Hayes and Jarvis, Carib Tours, ITC Classics, Complete Caribbean, Carrier, Expressions, Abercrombie & Kent, W&O Travel, Trailfinders, Destinology UK, Tropic Breeze. In Ireland, we can be booked through Joe Walsh Tours and Insurance Travel. This listing is not complete and is meant to serve as a guideline. It has come to our attention that some tour operators do not update their systems regularly and may therefore advise you that our resort is fully committed when it is in fact not. We invite you therefore to check availability at the resort with us directly via email jademountain@ansechastanet.com or via our reservation telephone lines if you have not been able to secure a reservation through your tour operator or travel agent. We would be only too sorry if you ended up going elsewhere so please feel free to contact us so that we can assist you! Hewanorra International Airport UVF (18 miles) - approximately 60 minutes George Charles Airport SLU (inter-island) (30 miles) - approximately 75 minutes. At Hewanorra Airport, our airport representative is stationed right outside of the arrival hall. We make taxi transfer arrangements on your behalf, once you provide us with your flight details. The taxi transfer charges will be posted to your extras account at the Resort, unless the reservation package you have selected includes the transfers. Our airport representative coordinates your arrival at the airport. Private sedan transfer charges are approximately US $100 each way for 2 persons from and to UVF and US $115 from SLU airport. Shared transfers can be requested. Luxury sedan transfers are also available. Please contact us for transfer costs. Advise us of your flight number and we will arrange for a car to meet you. Contact us for transfer costs. 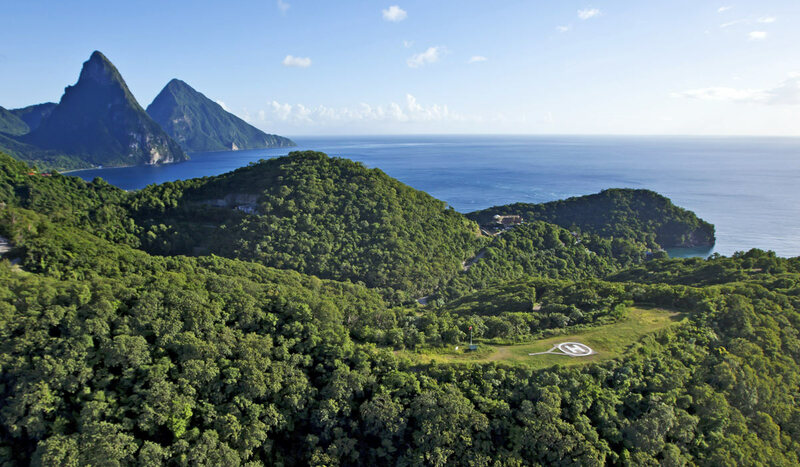 Our resorts Anse Chastanet and Jade Mountain own and operate a private helipad for the exclusive use by our guests. The helipad is situated in the hills behind the properties, a 5 minute drive to either property. The flying time from UVF Airport to our helipad is approximately 6 minutes and from SLU Airport, approximate 8 minutes. In comparison, a land taxi will take approximately 60 minutes from UVF Airport and 75 minutes from SLU Airport. 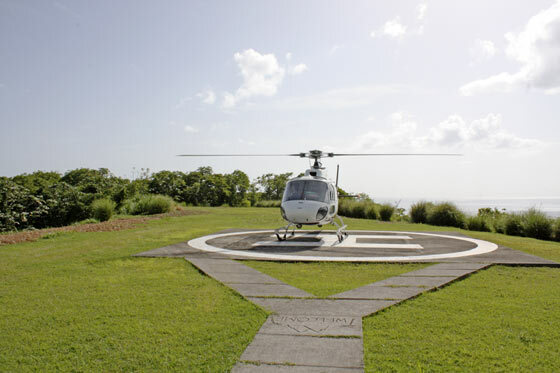 Arriving by helicopter affords our guests a spectacular first introduction to St.Lucia’s stunning lush tropical beauty. We book our helicopter transfers with the island's one and only helicopter company. The company requires a minimum of 4 passengers booked on any given flight prior to sending final confirmation of the transfer to us. As there is only one helicopter company, they enjoy good steady demand and therefore the final confirmation will come through eventually, even though it may only be the day prior to arrival. Should you wish to have a guaranteed helicopter transfer at the time you are making your reservation with us, you would need to guarantee a purchase of 4 seats, in case no other passengers will have signed up for the date and time you require. Should you wish to book a private helicopter transfer, 6 seats would need to be purchased. Helicopter transfers are available only during day light hours. Helicopter transfers are only available on Saint Lucia and cannot be booked to fly to neighboring islands. As there is a limited amount of helicopters, please know that mechanical issues or weather issues could always lead to last minute cancellation in which case the resort would automatically secure a land transfer for you. There may also be last minute delays over which we will have no influence as they could be caused by a variety of reasons. Please also be aware that your luggage will be transported to and reach the resort separately. Your hand luggage can travel with you. We thank you for your understanding. Our check-in time is 3:00 pm and check-out time is 12:00 noon. Our management team and your Major Domos are at hand all times to facililate special requests or arrange for baggage storage if required. Local Currency is the Eastern Caribbean Dollar (EC$) but the US Dollar is widely accepted at a conversion of approximate 2.60 EC Dollar for each US Dollar. 220 Volts/50 cycles - the hotel has a supply of adaptors and transformers available at reception. English is the official language but St. Lucians also speak a French derived Patois. All of our menus feature vegetarian dishes in addition to which we also have a completely vegetarian/vegan restaurant called Emerald's. Our culinary team is always willing and able to meet special dietary requests, but please contact us prior to arrival to advise us. There is a variety of meal plans available to be added to your room rate. You can choose from breakfast and dinner (MAP) to full board (FAP) and all-inclusive (AI). The meal plans can be added to the room reservation on an optional basis. From Dec 20 – Jan 3, room rates include the breakfast and dinner plan as the minimum meal plan requirement. The Breakfast and Dinner Plan (MAP) is available at US 100 per person per day plus 10% VAT (Value Added Tax) and 10% service charge. The All Meals Plan (FAP) is US 135 per person per day plus 10% VAT and 10% service charge. The All Inclusive Plan (AI) is US 180 per person per day plus 10% VAT and 10% service charge. Our sanctuary rates are based on singe or double occupancy. An extra person in room is US 150 plus 10% VAT (Value Added Tax) and 10% service charge in all categories. From Dec 20, 12 – Jan 2, 13, the extra person charge is US 240 plus 10% VAT and 10% service charge as it includes breakfast and dinner. Jade Mountain does not accept children under the age of 16 years. Each of the 24 infinity pool sanctuaries at Jade Mountain is a carefully designed, individual work of art and architecture. All of the sanctuaries celebrate an unparalleled view of the Pitons and the Caribbean Sea. In all of the sanctuaries, the 4th wall is open to the views while at the same time allowing for complete privacy. Expect grand sweeping spaces where bedroom, living area and the extravagant private infinity pool glide into one another to form extraordinary platforms floating out into nature. Four rate categories of infinity pool sanctuaries have been created to reflect the square footage of the sanctuaries and size of pool. Also, there are five Sky Suites which enjoy the same open floor plan and views with large bathtub but no in-sanctuary pool. All sanctuaries feature 15ft high ceilings and have the 4th wall open to the views. All other aspects, layout and size vary from sanctuary to sanctuary. In addition to locally made fine tropical wood furniture an eclectic collection of furniture has been placed in the sanctuaries giving each one of them their own individualistic ambiance. All Sky suites and infinity pool sanctuaries have king beds. Bathrooms feature chromatherapy whirlpool tubs designed to be enjoyed by one or two persons -tubs are mounted on a pedestal allowing best possible panoramic views whilst bathing. Each sanctuary has a shower towers with a rain shower, 6 body sprays, adjustable heights and separate hand shower. In-room facilities include fridge, tea/coffee making facilities, hair dryer, iron,ironing board and electronic in-room safe. Enjoy Molton Brown Body Remedies guest amenities exclusive to Jade Mountain in Saint Lucia, Frette bathrobes, slippers and Frette towels. Each of the 24 in-sanctuary infinity pools has its own individually designed glass tile color scheme which is then carried on into the individual bathrooms, giving each sanctuary its own unique and bold personality. The glass tile texture is complex in reflective and prismatic ways with each piece of tile unique due to their custom hand crafted fabrication. The 24 infinity pools are equipped with fiber optics to illuminate them at night. Guests have the option of allowing the system to cycle through a range of colors or setting it to one particular shade. The water in JADE MOUNTAIN'S infinity pools is purified by a highly sophisticated system, the primary mechanical filtration being through a zeolite sand filter and with the primary sterilization being ozone. Each pool receives individually filtered and sterilized water, and pool water cycles through the sterilization and filtration facilities approximately six times per day. Guest computers are located in the Jade Front Office. There is wireless internet (complimentary) in both the public facilities and our sanctuaries. As is customary in hotels, our front desk team will request a credit card at check-in in order to establish a line of credit with the resort. This is will allow you to charge any incidentals such as boutique, spa , scuba, excursions or any other charges not covered by your vacation package to your hotel account. When using a debit card at check-in, kindly note that a pre-authorization is taken on your debit card, which will show up on your account as a pending “charge”. If you do not intend to settle your final bill with this debit card at check-out, you should use a different card at the check-in process. Otherwise, the pre-authorization hold will remain a “charge” on your debit card and it may take up to 30 days before this ”charge” is being released by your bank. The exact procedure is different from bank to bank and the hotel has no influence over you bank’s procedures even if you use a different card at check-out. It is possible to walk from Jade Mountain to the sister resort Anse Chastanet as the properties are adjoining. It is an easy 5 minute downhill walk to our 2 beaches Anse Chastanet and Anse Mamin. The resort operates a resort shuttle for guests who wish to be driven instead. The resort encompasses 600 acres with 2 beaches : Anse Chastanet and Anse Mamin. It is possible to walk from Anse Chastanet beach to Anse Mamin beach along the coast. There also is a resort shuttle boat that takes our guests from one beach to the next. * Yoga at Jade Mountain – meet on Celestial Terrace - 7 - 8 a.m.
* Wine and Canape Reception on Monday from 5.30 - 6.30 p.m.
* Creole History Class in the Beach Bar Friday 11:30 a.m.
* Underwater Slideshow in Beach Bar, Wednesday 7 p.m.
* History, benefits and uses of Aromatherapy presented by our Spa Manager - Beach Bar – Thursdays from 3.30 p.m.
* Chocolate Sensory Tasting at Emerald Restaurant, Tue from 10 – 10.30 a.m.
* Full Breakfast in our Treehouse Restaurant from 7.00 - 10.00 a.m..
* Afternoon Tea in the Beach Bar 3.30 - 5.30 p.m.
* Dining in our Trou au Diable Restaurant celebrating Apsara, St Lucia–East India fusion cuisine daily except Tuesday; A beach grill menu is also available. * Coco Doux coconut bar at beach bar on Sundays from 11.00 a.m. - 3.00 p.m. Cancellation or amendment of reservations are subject to a 3 nights’ cancellation fee if notification is not received 21 days prior to arrival for reservations Jan 3 – Dec 19. Christmas/New Year (Dec 20 – Jan 2) reservations are subject to a 3 nights’ cancellation fee if notification is not received 65–22 days prior to arrival. Christmas/New Year reservations are non-refundable if cancelled or amended within 21 days of arrival. A minimum 3-night fee per reserved week applies for short stays. No refund for no shows at any time. We suggest that travel insurance is taken. Credit Refunds due to reservation cancellation are subject to a 5% processing fee. Group Reservations and Cancellations terms differ. Visitors must carry passports which must be valid for a minimum of 3 months. Some airlines will refuse boarding if the passport is set to expire within a 3 month timeframe. Visas are not required where the visitor is a citizen of the USA or a Commonwealth country, or where there is agreement for exemption between the home country and St. Lucia. Most European Community countries do not require a visa. Please visit http://www.govt.lc/services/apply-for-saint-lucia-non-immigrant-visa if you are not certain whether or not you require a visaIf you require a visa please let us know, so we can assist you with the visa application process.